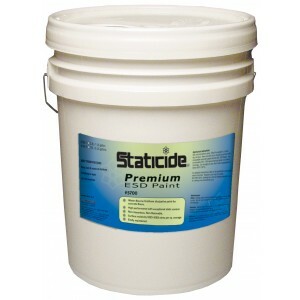 ACL Staticide Premium ESD Paint 5-Gallon Pail, Color: Blue. This high-performance, water-based polyurethane coating is formulated with the finest high-tech materials for consistent static protection, resilience, and brilliant appearance. This is a high quality and economical alternative to ESD epoxy or ESD tile that will save in material and labor costs. Trouble-free to install and maintain, the rich viscosity of the paint allows for effortless mixing, application, and even distribution of conductive ingredients. The color palette allows for versatility in workplace aesthetics. The light colors can be used to designate a particular work space or reflect light for a more cheerful environment. This paint is perfectly suited for electronics manufacturing, assembly, and ESD protected areas (EPAs).